Posted January 1, 2016 by John W. Moravec, Ph.D.
One year ago, Manifesto 15 was released: a statement that inspired a conversation about principles for building positive education futures, grounded on the idea that we urgently need to evolve learning. This is a public declaration of a vision for better education futures. In the months since its release, it’s been read and discussed by thousands of people, signed by hundreds, featured in various media and conferences, and teams of volunteers around the world have translated it into 18 additional languages (plus a kids’ version and visual notes!) – and the movement continues to grow! We are grateful for the interest in this project and the support we have received around the world. To help continue the conversation, we have drafted a handbook for leading change, which is available at the Manifesto 15 website. This handbook presents some guidelines on how we can move forward, including hosting conversations, workshops, and starting local Manifesto 15 groups. The guide is an invitation to join us and build community, centered on trust and open dialogue, as we work to change the face of education. And, it contains some posters to help you get started with your own messaging. 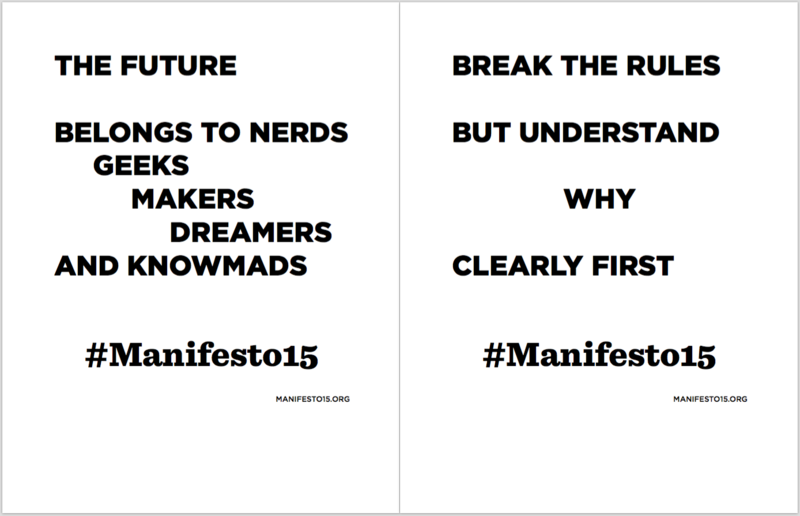 Please take Manifesto 15 as a starting point, and build in your own ideas and practices. Or, create and share your own sets of principles. The manifesto and the emerging movement is open for discussion, remixing, and sharing – and we encourage you to drive the conversation with your own networks. If there’s any way that we can help with conversations in your own community, please do not hesitate to contact us: manifesto15@educationfutures.com. Again, thank you for your support and work in facilitating this growing movement. We look forward to evolving learning with you in 2016 and beyond. Posted October 9, 2012 by John W. Moravec, Ph.D. In 1980, Seymour Papert predicted that computers would fundamentally transform education –and ultimately make schools, themselves, redundant. 30 years later, computers in schools are the norm, but we are still teaching the old way. Why? In education, we have a hard time disentangling technologies from our conversations about innovations in learning. Too often, we place technologies in the forefront, which end up obscuring authentic knowledge formation. We often take the best technologies and squander the opportunities they afford us. Our knowledge-based societies demand a deeper change in our culture of teaching, and, particularly, in the ways in which we learn (and unlearn). Moreover: The impacts of accelerating technological and social changes on education are enormous. Today’s stakeholders in our youths’ future must prepare them for futures that none of us can even dream are possible. We need to rethink and explore all the “invisible” (non-formal, non-certified, but equally relevant) ways of learning in a world where personal knowledge development, comprised of both tacit and explicit elements, is rapidly becoming more valuable than commodified, industrial-style information delivery. How can we create innovators, capable of leveraging their unique imaginations and creativity? In the Invisible Learning project, we sought to research and share experiences and innovative perspectives, focused on rethinking strategies and innovative approaches to learn and unlearn continuously. We highlighted the importance of critical thinking of the roles of formal, informal, non-formal and serendipitous education at all levels – which can contribute to the creation of sustainable processes of learning, innovating and designing new cultures for a global society. Education in the Invisible Learning paradigm enables students to act on their knowledge, applying what they know to solve problems – including problems that have not been solved before. This contextual, purposive application of personal knowledge to create innovative solutions negates the value of non-innovation-producing regimes (i.e., standardized testing). The purposive application of technologies can help. Our questions around educational improvement should therefore not be around what to learn, but rather about how we can learn. And, how we can make what we learned invisibly visible. Posted July 16, 2012 by John W. Moravec, Ph.D.
Last week, I spoke with Vernor Vinge [Wikipedia | website], a retired San Diego State University professor of mathematics. He is better known as a five-time Hugo Award-winning science fiction author. His works include True Names, Fast Times at Fairmont High, and Rainbows End. Most importantly, his 1993 essay “The Coming Technological Singularity,” argues that accelerating technological change will bring about the end of the human era as we know it, and that the world will become so complex and foreign to human observers, it will be impossible to predict what will happen next. Ray Kurzweil and others have since contributed to the popularization of the Singularity, but the conversation has been centered on technological determinism. In a world that is consumed by accelerating change, what are the implications for systems that are at risk of being outpaced — namely, human systems? And, what are the implications for how we will learn and work in the near future? I got this sort of vision where the human workplace is scattered in both space and time, and for a single career, it’s not a merely a matter of changing your career every couple years, it’s a matter of actually changing your point of attention on smaller time scales. What can science fiction tell us about our future? According to Vinge, a lot. He helped introduce the cyberpunk genre in the early with his 1981 Novel, true Names. He says, “the technological situation we have now is very similar to what was described in True Names, which actually was implicitly targeted in the year 2014,” but much of that can be attributed to pure luck. Before the year 1984, people generally looked at computers the way George Orwell did in his novel Nineteen Eighty-Four. After 1984, people had these great visions of computers freeing the people from tyrannies, and that is still a real possibility… and it is a possibility that has come true in large parts of the world. But, I would say the jury is still out as to what the ultimate effectiveness of computers and communication automation favors tyranny or favors liberty. I’m putting my bets on liberty, but I would say it’s not an obvious win in either direction. I’m still where I was in my 1993 essay that I gave at a NASA meeting, and that is that I define the Technological Singularity as being our developing, through technology, superhuman intelligence — or becoming, ourselves, superhuman intelligent through technology. And, I think calling that the Singularity is actually a very good term in the sense of vast and unknowable change. A qualitatively different sort of change than technological progress in the past. The development of computers that are “awake” and superhumanly intelligent. Large computer networks (and their associated users) may “wake up” as a superhumanly intelligent entity. Biological science may find ways to improve upon the natural human intellect. The networked sum of all the embedded microprocessors in all our devices becomes a kind of digital Gaia. That qualifies, as an ensemble, as a superhuman entity. That is probably the weirdest of all possibilities because, if anything, it looks like animism. And, sometimes I point to it when I want to make the issue that this can be very strange. I think that actually the networking of embedded microprocessors is going like gangbusters. The network that is the Internet plus humanity, that is also going with extraordinarily surprises, if you just look at the successes in the various schemes that go by names like crowdsourcing. To me, those have been astounding, and should give people real pause with how to use the intellectual resources actually that we have out there. So far, we do not have a single computer that is really of human-level intelligence, and I think that is going to happen. But, it is a kind of an amazing thing that we have an installed base of seven billion of these devices out there. Talking about the run-up to the Singularity makes sense for several different reasons. One is, we have to get through it. The other is that it is our opportunity, as the chief players… it’s our opportunity to make things turn out safely and happily. In the meantime, at just the level of just getting one’s job done, I think there are real changes that are going to be happening in education and more broadly in training issues. I think one thing that is going to become more-and-more evident is the fact that we have seven billion people out there who are variously good … very good … at different things. And, there are ways of enhancing and amplifying that by collaboration. And, when I say “collaboration” […] it is a very good thing. But, if you look at some of the group mind projects and crowdsourcing projects, there is very great imagination that can be exercised in making collaboration effective. One thing is to interface people who have very different skills — that can actually be helped a lot by the network. When dealing with unknown futures, it remains unknown how to prepare people best for these futures. He states that the best pathway involves teaching children “to learn how to learn” (a key theme in Fast Times at Fairmont High), and that we need to encourage the development of positive futures by attending to diversity in our learning systems. We need to not facilitate the formation of diverse students, but we also need to abandon a monoculture approach to education and attend to a diverse ecology of options in teaching and evaluation. Proudly presenting "StoryTech: A personalized guide to the 21st century"
Posted June 19, 2012 by John W. Moravec, Ph.D.
Education Futures is proud to present the second edition of StoryTech: A personalized guide to the 21st century, written by Arthur Harkins and George Kubik. The book is offered as a free download through Education Futures. The guidebook offers a dynamic 21st century approach for integrating the power of your personal stories with the collective wisdom of groups, organizations, and societies. This book introduces readers to a very old process that could enhance strategic abilities to deal with change and opportunity. To learn more about StoryTech, and to download a free copy, visit www.educationfutures.com/storytech. Posted May 30, 2012 by John W. Moravec, Ph.D.
Education Futures contributors Arthur Harkins and John Moravec have been chosen as “highly commended” award winners at the Emerald Literati Network Awards for Excellence 2012 for their article entitled Systemic Approaches to Knowledge Development and Application published in the journal, On the Horizon. American preK-12 schooling systems may be primarily mechanical, but some of their students may learn at home or on the internet in parallel evolutionary and teleological ways. The question is how such students can survive the conservative impacts of the outdated majority culture mechanical model, especially if it is delivered in unsophisticated and undemanding ways. They may have to depend upon self-education, the help of their parents, and luck to avoid becoming the casualties of a declining knowledge-resistant culture. We believe that the MET archetypes, buttressed by [augmented reality], can help such people, beginning immediately. Posted March 20, 2012 by John W. Moravec, Ph.D.
Last week, I traveled to Utrecht, The Netherlands, to participate in the 3rd Space World Conference, hosted by seats2meet.com, a co-working enterprise that is establishing locations throughout the world. The event was designed to introduce people to sustainable co-working, and to also connect co-working centers and thought leaders together. Knowledge sharing, the enabling of serendipity and Society 3.0 are some of the other key elements that were covered. Obviously, the people populating 3rd spaces need a set of skills, attitudes and craftsmanship that is different form the one their industrial ancestors had. So education is an enormously important topic in this context and also one that “knowmad” John Moravec could only broach at the conference. It is true that we need to be rather imaginative in this area. However, and somewhat paradoxically, we also need to be very clear about the specific parameters that we want to use in order to set up a 3rd space of education as one of imagination, one that facilitates the formation of individuals able to navigate their tech-saturated environment as active contributors rather than passive consumers. The livestream of the event attracted over 1000 viewers from 31 countries, and nearly 125,000 people were reached by Twitter with approximately 1.8 million impressions. The topic trended in the Dutch twittersphere, and I’m sure it trended in other countries as well. From this initial success, seats2meet.com plans to create a global platform to connect co-working spaces from around the world. Stay tuned!